Typical of this chain. No surprises one way or another. 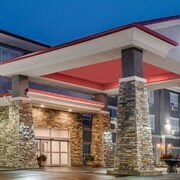 Where to find Moose Jaw hotels near an airport? Where can I find hotels in Moose Jaw that are near tourist attractions? 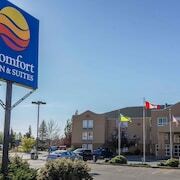 Traveling to Southwestern Saskatchewan and keen to book accommodation in Moose Jaw? Currently, Expedia's extensive database has 14 apartments and hotels within a short drive of Moose Jaw's downtown area. 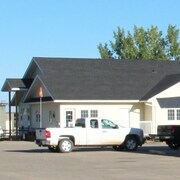 The Dreamland Motel is a much-loved hotel choice because it is conveniently located to Moose Jaw's center. The closest hotels to the Western Development Museum are the Temple Gardens Hotel & Spa and Days Inn Moose Jaw. 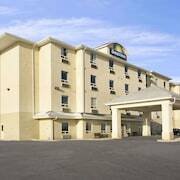 The Heritage Inn Hotel & Convention Centre Moose Jaw and Comfort Inn & Suites are close to the Tunnels of Moose Jaw. If you choose to book accommodation close the Moose Jaw Museum and Art Gallery, choose from accommodation options including the Wakamow Heights Bed & Breakfast and Super 8 Moose Jaw SK. 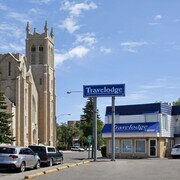 Accommodation options that are near Towne and Country Mall, include the Moose Jaw Travelodge and Knights Inn Moose Jaw. 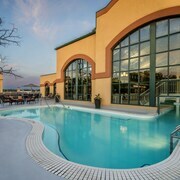 The Thriftlodge Moose Jaw is 4 kilometres (2 miles) from the heart of Moose Jaw. Alternatively, the Capone's Hideaway Motel is positioned 1 kilometre (1 mile) away. Two other Expedia-listed options in this area include the Best Western Plus Moose Jaw and the Ramada Moose Jaw. If you are really into sports and like to watch live games, you might choose to take a trip to Brandt Center, which is 60 kilometres (37 miles) to the east of Moose Jaw. Those wishing to stay close to the stadium can select from the DoubleTree by Hilton Hotel & Conference Centre Regina and the Delta Hotels by Marriott Regina. 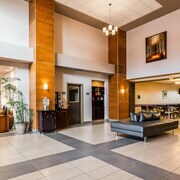 For those travelers arriving or departing via Regina International Airport, you may like to book accommodation at The Hotel Saskatchewan, Autograph Collection, or Best Western Seven Oaks Inn, both of which are a short trip away. If ever a city of 35,000 people had it all, it would be Moose Jaw. Between shopping and eating downtown, relaxing in the natural mineral springs, or exploring the underground bootlegging tunnels, you’ll want to sleep in comfortable accommodations so you don’t miss anything! The history of Moose Jaw is fascinating. First a home for Cree and Assiniboine people, the city has been a lot of things to a lot of people. One of the most interesting pieces of history is from prohibition days, when booze barons used the underground steam tunnels to keep Moose Jaw speakeasies supplied. Today, a tour of these tunnels is one of the most popular attractions near Moose Jaw hotels. Above ground, a whole host of activities are available in downtown Moose Jaw. Enjoy boutique eateries and shopping or visit one of the many museums that explore Moose Jaw culture. Visit the Moose Jaw Cultural Centre for a performance, or go on a scavenger hunt for all of the Moose Jaw murals painted on downtown buildings, inside and out. Once you’ve begun your Moose Jaw adventure, you may want to take a break to rejuvenate. A visit to the area’s natural mineral springs is the perfect way to relax before heading out on the town again. 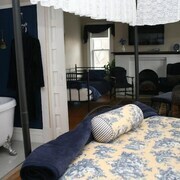 Or, book hotels in Moose Jaw near spas and pamper yourself for as long as you’d like. No matter what you decide to do in Moose Jaw, make the most of your holiday by booking with Expedia.ca and saving. Use your Expedia+ and get exclusive offers or book a vacation package and bundle your savings. Book soon, before these deals go underground! 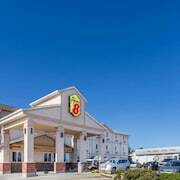 What are the most popular Moose Jaw hotels? Are there hotels in other cities near Moose Jaw? What other types of accommodations are available in Moose Jaw? Explore Moose Jaw with Expedia.ca’s Travel Guides to find the best flights, cars, holiday packages and more! Flights from McCarran Intl. to Calgary Intl. Flights from Cancun Intl. to Pearson Intl. Flights from O'Hare Intl. to Pearson Intl.